With over 34 years' experience in crafting fine itineraries for clients who appreciate Evergreen Tours' carefully hand-crafted itineraries which deliver the right balance of must-see sights, cultural interactions, local insights, culinary delights and some of South America's's best-kept secrets. A trip to South America will ensure you have one of the most complete travel experiences possible. From the biodiversity of the Amazon jungle to the unique wildlife of the Galapagos Islands, from the ancient Inca civilisations of Peru to the vibrant capitals of Rio de Janeiro and Buenos Aires, each day will leave you astounded and wanting more. Here you'll find a combination of the very best and most affordable touring and luxury cruising programs including superb sightseeing, quality meals and excellent service. Discover for yourself why Evergreen Tours offers the relaxing and convenient way to explore amazing South America. You will enjoy the hassle-free Evergreen Experience: from the carefully crafted range of itineraries, to the cheerful welcome in every destination, from the exceptional knowledge of the tour directors to the exciting destinations, must-do tours and premium inclusions that make these tours memorable, magical and excellent value. Evergreen Tours has an excellent reputation for quality, value and professional service. From start to finish, Evergreen carefully plans, arranges and co-ordinates every aspect of your holiday. These itineraries are carefully designed with a perfect balance of inclusions, must-see sights and free time, all designed to reveal South America's spectacular highlights. Evergreen's 20 Day Best of South America Tour features the iconic highlights of South America: tour Machu Picchu & the Sacred Valley, Cusco and Lake Titicaca in Peru. In Brazil, experience Iguazu Falls and see Christ the Redeemer statue on Corcovado Mountain in Rio, while in Argentina discover the magic of Buenos Aires and experience a stay in an Estancia. Add a Galapagos Islands Cruise on the MV Galapagos Legend to the 20 Day Best of South America and discover the region's unique wildlife - penguins, marine iguanas, blue footed boobies, sea lions, sharks, and myriad marine and other wildlife – on Evergreen's 26 Day South America Unveiled tour. 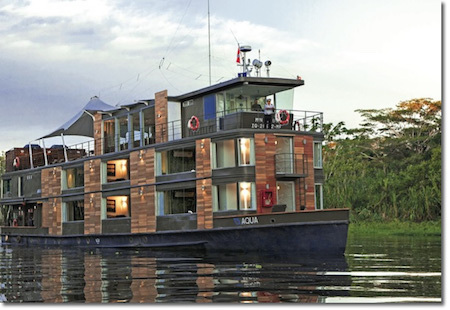 Add an Amazon extension to the 20 Day Best of South America and opt to stay in either a Lodge or cruise aboard the luxurious MV Aqua and explore the Amazon region by river for Evergreen's 24 Day South American Explorer. From the superb 20-day Best of South America Tour, add a 13-night South America cruise from Buenos Aires to Santiago onboard Holland America line's luxurious MS Zaandam. Embark in Buenos Aires then cruise the East Coast of Argentinian Patagonia through the Beagle Channel and on through the spectacular Glacier Alley to Ushuaia. After navigating Cape Horn, the world's most southerly mainland point, the cruise continues through the iconic Chilean fjords, including Tierra del Fuego and the Canal Sarmiento to Puerto Montt and onto World Heritage listed city Valparaiso. People who ordered South America Tours & Cruises also ordered the free travel brochures below. Click on the images to find out more about these brochures.